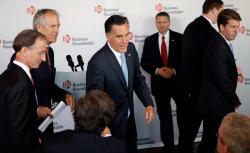 Romney’s Bain capitalism: Did he betray the values of free enterprise? Is Mitt Romney’s career a betrayal of capitalism? Will the 2012 election be a referendum on capitalism? If so, which party will win? The answer may depend on who defines capitalism, and how. These claims about capitalism—that it rewards risk, creates jobs, and spreads success—sound dogmatic. But they’re actually falsifiable. They demonstrate that faith in the free market rests on underlying values of risk-taking, shared sacrifice, and shared reward. When capitalism undercuts these values, it loses credibility. That’s why the attacks on Romney’s record at Bain are dangerous. They accuse him not of practicing capitalism, but of betraying it. Harris Interactive polls from 1998 to 2010 reflect a similar pattern. According to the AEI report, the percentage of Americans who agreed that “Wall Street only cares about money and absolutely nothing else” never dipped below 53. The percentage who agreed that “people on Wall Street are as honest and moral as other people” or that “most successful people on Wall Street deserve to make the kind of money they earn” never reached 50. The percentage who agreed that “what is good for Wall Street is good for the country” maxed out at 43. In 1985, 2002, and 2009, clear majorities told pollsters for CBS and Fox News that most corporate executives weren’t honest. Over the years, Romney’s political opponents have exploited the public’s misgivings. They’ve argued that he didn’t really earn the money he made, that he put profits before the public interest, and that he enriched himself at the expense of ordinary people. The harshest of these critiques was a video distributed this year by a PAC supporting Newt Gingrich. It began by extolling the values of free enterprise: “Capitalism made America great. Free markets, innovation, hard work.” But it argued that Romney had subverted these values. Instead of building enterprises and communities, he had raided and stripped family businesses, “dumping” their stock and “playing the system for a quick buck.” Instead of improving products, he had cheapened them. Instead of hiring people, he had fired them to squeeze out extra profits. Instead of helping his country, he had “sent jobs overseas.” Instead of nurturing companies, he had loaded them with debt and siphoned out the money. Instead of serving small investors, he had suckered and fleeced them. Instead of sharing the pain when workers lost their jobs and investors lost their savings, he and his pals had always managed “to turn the misfortunes of others into their own enormous financial gains.” He had betrayed every moral principle of business: loyalty, quality, service, prudence, stewardship, risk. We’re going to get attacked from the left, from Barack Obama, on capitalism. I know that people are going to say, “Oh, you should only practice it this way or that way,” and think they know better than the private market. My view is capitalism works. Free enterprise works. And I find it kind of strange, on a stage like this with Republicans, having to describe how private equity and venture capital work and how they’re successful and how they create jobs. Was Romney a good capitalist or a bad one? Did he honor the values of free enterprise or forsake them? Romney might win that debate. But it isn’t the debate he wanted to have.